The LaserJet 2420dn is rated by HP at 30PPM with a warmup time of less than 10 seconds, and can hold 350 sheets total in its two trays. The internal paper tray can hold 200 regular sheets of up to legal size, while the pull-out multipurpose tray holds another 150 sheets or 10 envelopes. An optional 500-sheet tray can boost capacity further, though the unit we reviewed did not include this. 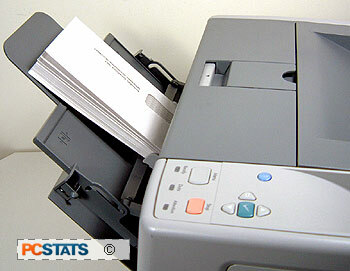 Automatic duplex printing is supported, at a pace a little less than non-duplexed output. HP recommends a monthly duty cycle of no more than 75,000 pages. The introductory toner cartridge that ships with the HP LaserJet 2420dn is rated for about 6000 pages of standard black text at 5% coverage. Replacement cartridges cost about $125US or $205US (CAN$155-255) for 6000 or 12,000 page units respectively. Power consumption is a hefty 625 Watts when printing, but only 11 Watts when idle, 8.5W in 'sleep' mode. Like most printers these days, the LaserJet 2420dn does not ship with a printer cable. Sadly, HP omitted a printed manual also, though full documentation is available on the CD. A fold out help guide helps with setup, and a power cord is also included. It's footprint is about 16.5" x 15.5" and it measures just over ten inches tall. 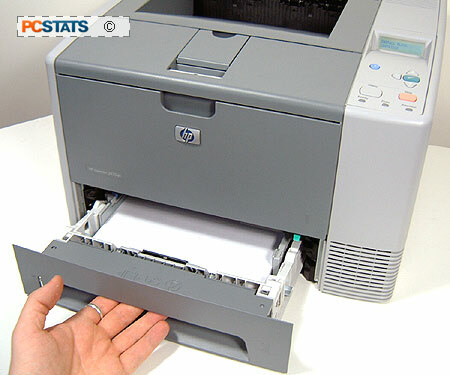 The printer weighs a not-unreasonable 36lbs, and is easily movable by one person as HP wisely integrated hand-holds into its design.The HP LaserJet 2420dn carries a one year warranty, with service at approved HP service centers.